Summer was very eventful when it came to street art, but it is time to say goodbye to it. The month of September was very busy with a range of street art festival taking place all over the world, such as CRUSH Walls and Nuart. We are looking back to the month behind us to bring you the most stunnig new pieces that left us breathless. As always, make sure you follow us on Instagram for even more of street art. Mexican calligraffiti artist Said Dokins created a fantastic mural on the occasion of BLOOP Art Festival, a long-term project to change the urban landscapes of Ibiza. Titled Hope, the two-part mural is created in a school playground together with the children from the same institution. Asking each student what Ibiza represented to them, he painted every single word with his unique calligraphy style which fuses west and east. 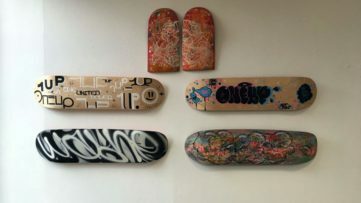 A Spanish urban artist, SpY creates work which involves the appropriation of urban elements through transformation or replication, commentary on urban reality and the interference in its communicative codes. He also took part in the BLOOP Art Festival, creating a stunning piece for the festival’s Open Air Gallery. Titled Sun, this massive installation is a circle in gold, made with golden thermal blankets that are often used for emergencies. With this work, the artist sheds light upon the plight of the immigrants who ashore on Europe in search of a brighter future. Here is another mural created for the Open Air Gallery at BLOOP Art Festival. A Greek artist known for his outstanding figurative murals created on a large scale, INO created a stunning piece called Hopeless. Choosing the surfaces of the Design Apartments La kiki on Sant Josep’s bay, he created a piece which presents a critique towards modern societies where happiness is based on materialism, and where big companies and advertising target youth. A Dutch artistic duo, Telmo Miel are celebrated for murals combining classic Realism, Abstraction and Surrealism. The duo took part in the FestiWall in Sicily which took place in three parts of the city of Ragusa. Their massive piece is an ode to motherhood. Titled Prepared, the piece depicts a mother suggestively placing a helmet on her thoroughly armored son. This compelling piece tells a story of a mother’s love, the importance of family and the protection they provide. A prominent Australian street and fine artist, Fintan Magee is celebrated for his socially and environmentally engaged works. The artist took part in this year’s Nuart Festival in Stavanger, which welcomed 26 artists from 12 countries. With his stunning piece, the artist paid tribute to Stavanger’s Ren By Gjengen which is dedicated to keeping the streets of the city clean. Artist Cristian Blanxer and Victor Garcia created a stunning piece in Aracena, Spain. This amazing piece depicting a little girl facing front in a realistic style is titled Mala hierba. An icon of the American contemporary art scene, Shepard Fairey took part in this year’s CRUSH Walls in Denver, Colorado. The festival was certainly the most ambitious edition of the festival so far. On the occasion of the festival, the artist transformed a wall on Larimer Street in RiNo with a large-scale mural titled Power and Equality. 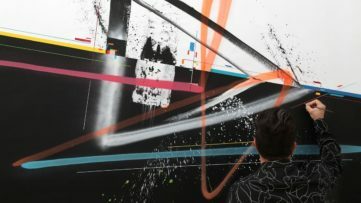 A Canadian visual artist based in Brooklyn, Li-Hill creates works which range from smaller multiples to enormous murals that explore industrialization, scientific breakthrough, man versus nature and information saturation. He recently visited Helsinki on the occasion of the Helsinki Urban Art festival. He created a giant mural at Sähköttäjänkatu 4, on an eighth-story house located on the upper deck of the area. 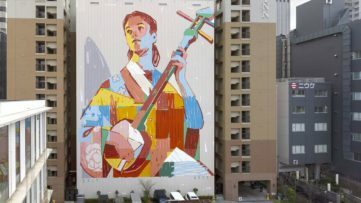 Thirty-four meters high, the piece is the largest mural in the city. An artist from Poland, Natalia Rak is known for her extremely vibrant large-scale murals. Invited by the company Medicine, the artist visited Krakow, Poland to create a new stunning piece titled Black Pearl. Covering an entire building, the piece depicts a crow carrying a black pearl and surrounded by flowers. 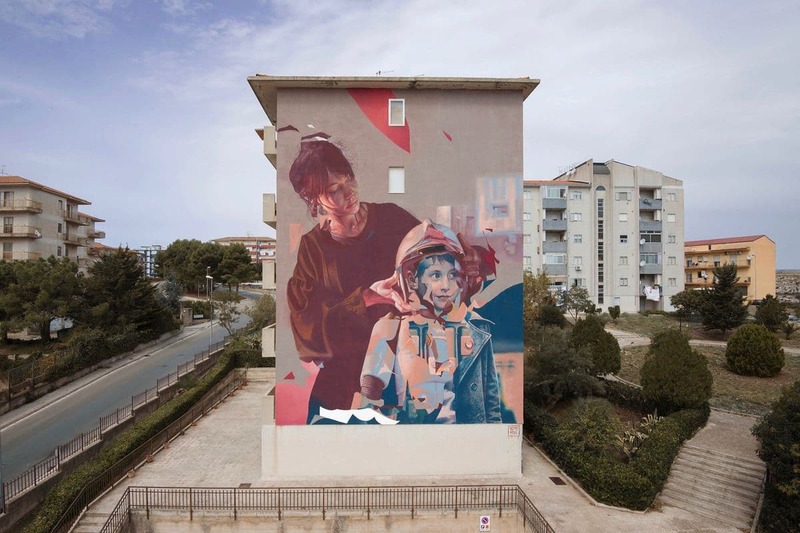 An Italian street and urban artist, Bifido uses his art to make a statement and create an impact on important issues of war, violence, capitalism and childhood. The artist presented his latest work in Italy, located on an unusual spot for this type of art. This inspiring work is created on a medieval tower with a backdrop view to the sea. Made for the festival Seminaria, he reflected the struggles the village endured during the summer drought. Featured image: Telmo Miel in Ragusa, Italy.